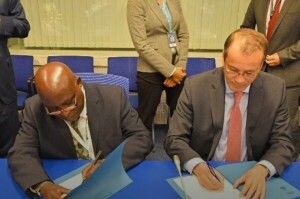 VIENNA - The Caribbean Agricultural Health and Food Safety Agency (CAHFSA) and the International Atomic Energy Agency (IAEA) have signed an agreement to pursue areas of technical cooperation in the use of nuclear science and technology for sustainable agricultural health and food safety in the Caribbean. The agreement was inked at the headquarters of the IAEA in Vienna, Austria last week. The Practical Arrangement provides the framework for collaboration to address challenges faced by the Member States of both organisations as well as Small Island Developing States in improving their agricultural sector. The objective of these arrangements is to set forth the framework for non-exclusive cooperation between the parties in the area of technical cooperation in the use of nuclear science and technology for sustainable agricultural health and food safety. Collaboration on awareness raising about work of the IAEA, in particular, among decision-makers in the IAEA Member States. Exchange and dissemination of unclassified information, including publications and sharing of experiences and best practices in the areas of animal health, plant health and food safety. Photo: Chief Executive Officer of CAHFSA, L. Simeon Collins (l), and Cornel Feruta, IAEA Chief Coordinator, Director General Office for Coordination, sign the agreement.